Resolution 1 (to amend our Parish By-Laws): 709 in favor, 13 opposed – 98 % approval. Resolution 2 (to amend our Articles of Incorporation): 707 in favor, 15 opposed – 98% approval. Resolution 3 (to disaffiliate with TEC and affiliate with ACNA or some other Province of the Anglican Communion): 703 in favor, 19 opposed – 97% approval. The Vestry and I have made arrangements for St. Andrew’s to affiliate with The Diocese of The Holy Spirit, a diocese within the Anglican Church in North America. This affiliation will be effective upon the certification of our vote by the CPA firm at 3.00 pm, 2 April, at the latest. Our Bishop will be The Rt. Rev’d John Guernsey. Bishop Guernsey is the long-time Rector of All Saints Church in Dale City, Virginia and will be well known to several within St. Andrew’s. I have known +John for over 20 years, dating back to my time at Virginia Seminary. You will discover that he shares many of the priorities that we have as a parish; from our commitment to missions (the Bishop is the Chairman of the Board for SOMA – a well known mission agency) to our passion to see every member equipped for ministry with both Word and Spirit. I have made arrangements for Bishop Guernsey to visit and preach at the Wednesday night service, 28 April 2010, followed by a time of healing prayer led by the Bishop. Please make plans to attend. Lastly, the departure of this parish from the Diocese of South Carolina was not hastily made nor was it an easy decision. Indeed, this struggle has extended well beyond the past decade costing this parish one well-beloved Rector. Any sense of sadness over our separation is tempered by our joyful sense of the Lord’s forward-looking call upon our lives; by our common love for our Lord and by the common knowledge that our difficulty lay with the spiritual headship of the National Church, of which the Diocese of South Carolina remains, and intends to remain, a part, and not with the Bishop of South Carolina. And so, I must say “thank you” to Bishop Lawrence. From the day I met +Mark in the candidacy process I have spoken with him often about St. Andrew’s costly efforts to remain faithful to the gospel in the midst of the Episcopal Church’s increasing abandonment of the faith as revealed through Scripture and Tradition. These conversations have continued throughout +Mark’s episcopacy and have grown to include the Vestry of St. Andrew’s as well as the Standing Committee of the Diocese of South Carolina. I have found in Bishop Lawrence a friend and co-laborer in the ministry of the Gospel. We share a mutual desire to maintain our fraternal relationship and have committed to one another that St. Andrew’s and the Diocese of South Carolina will continue to partner in Gospel ministry as opportunity and circumstance permit. Please remember to pray for the Diocese of South Carolina as we desire nothing less than God’s best for them. Read it all here. 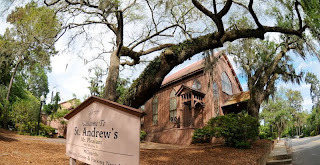 St. Andrew's is a flagship parish in the Diocese of South Carolina. Steve is one of the leading voices for taking the church into the new generation. This is a major moment in the history of church. Meanwhile, consecration plans continue in the Episcopal Diocese of Los Angeles without apparently caution or care for how this impacts the wider church. UPDATE: Episcopal Diocese of South Carolina Bishop Mark Lawrence shows how it should be done. God bless him. I received a phone call from the Reverend Steve Wood, rector of St. Andrew’s, Mt. Pleasant, the day before yesterday, Sunday, March 28, 2010, that the Vestry and members of the parish voted to leave The Episcopal Church and affiliate with the Anglican Church in North America. Although I am not surprised by this decision, I am saddened by it. In fact there is a poignant irony in the departure of St. Andrew’s from the Diocese and from The Episcopal Church. As bishop of the Diocese of South Carolina, I receive almost daily letters and emails from people across this Church suggesting that our stance gives them encouragement to remain and persevere within TEC. Yet here at home we could not hold one of our strongest congregations. The departure of The Episcopal Church from the way of Christ and the Biblically rooted teachings of the Church has become too discordant for them to tolerate any longer. While the ramification from their departure has yet to unfold in its entirety, I hope many among us will look for ways to continue our mutual ministry and relationships. The arrangements to be made for those within the congregation who wish to remain within the Diocese of South Carolina and The Episcopal Church will be among the subjects that I will be discussing with Steve and the parish leadership, as well as among our diocesan leaders. By God’s grace we will keep St. Andrew’s in our prayers and work with them to find ways to cooperate in gospel mission and ministry that honors Jesus Christ and his Kingdom. Hallelujah for Steve Wood+ and St. Andrews!! It's not that easy. The people may leave and join the ACNA or any church they want to. The assets of St. Andrew's will remain with the TEC. Changing their constitution and parish by-laws will not hold up in court as there is plenty of precedent for that. Actually, in South Carolina they can. The Dennis Canon recently died a quick death thanks to the state's supreme court. Assuming the trustees for the parish are on the property deed, title is theirs free and clear. And ban in 5. . .4.. .3. . .2. . .
What did you do? Were you not aware of the commenting guidelines at SFIF? Your jubilation at the splitting of Christ's church, in HOLY WEEK, is sickening. Go have a tea party. How have they split Christ's church? They are still Anglicans ... or do you not consider TEC to be Anglican? Why would Steve in FC be banned at SF? That makes no sense. BabyBlue: "Why would Steve in FC be banned at SF? That makes no sense." I don't know. I was just reading through the comments when I saw that he had been banned. Apparently, the following commenter thought it was egregious enough to predict a banning. At a time when Bishop Lawrence is apparently striving to hold things together from a traditionalist viewpoint in South Carolina, I would think this action would be regarded as impulsive and disrespectful towards Lawrence. While I generally am of the view that secession is a disfavored reaction to issues that have arisen in the Church, I would think that seceding from a diocese where the leadership is clearly hewing to a traditionalist approach would be particularly inappropriate for someone like Fr. Wood in South Carolina. That being said, I hope he left the Church when reached a point of decision that secession was the only course for him and did not use his position as rector to advocate for secession to the congregation. Actually Steven, the supreme court in South Carolina is the first state supreme court to rule in favor of the breakaway group as to the ownership of the church assets. Most breakaway groups have lost in their battle to claim ownership to the property and other assets that they broke away from. So far all their petitions to the U.S. Supreme Court have been deigned. The SCOTUS will eventually will decide as to the legality of the Dennis Canon and until that happens any celebration on the part of the parties involved is premature. As said before, the is plenty of precedent to affirm the Dennis Canon. I can appreciate your thoughts on our Rector, Steve Wood. Let me assure you and others, that this has not been a decision or a leading that has happened over the course of weeks or months. This more broad discernment of where God is leading St Andrews has been going on for 12 years. (even before Steve Wood arrived in Charleston) And yes, while we certainly identify and have empathy for the wonderful Diocese that we have been a part of, including a wonderful leader in Bishop Lawrence, we feel God is taking us in a different direction. He has been extremely honoring and respectful of our path, and we of his. Our vestry has spent countless hours upon hours in prayer for our church, our diocese, and our community. And no, Steve has not used his position to assert or pursuade others in this diocese. His concern is St Andrews. If you were to ask other leaders in the area, I'm sure they would tell you the same. We continue to keep the Diocese of SC in our prayers, particularly their leadership. I believe that St. Andrew's had to go now if they were ever going to leave TEC. This brave Diocese and Godly Bishop cannot stand up to the Legions from 815 for too much longer. Read the posts from Scout, DavidH, "Father" Weir, etc. It is abundantly clear that only the hard assets matter, not the people. I violated Stand Firm's Prime Directive with a little humorous ditty, sung to tune of "Stand Up, Stand Up for Jesus," that called for people to get out of TEC for ACNA. I knew I was risking defenestration, but I think it is important for SC parishes to get out now, per the comment of Anonymous at 10:37. Tsk, tsk, naughty, naughty little boy. Stand Firm's Prime Directive does not tolerate a little humor. Knowing that you were risking a banning, you surely must have known that your comment was at risk of being deleted as well... which would then work against your stated wish of alerting the SC parishes to get out now. Oh well. Do you remember the lyrics to your humorous ditty that called for people to get out TEc for ACNA? If yes, and if BabyBlue doesn't mind, then post it here. I'd like to have a good laugh. Did attempt to plead your case, Steven, but alas, for naught! Remember, God has a track record of raising the dead and bringing them dry bones back to life. We should pause a moment perhaps before, even with the best of intentions, we call out when God has perhaps called some to go in the wilderness, He will go with them. Let us pray for our brothers and sisters - for who's to say who shall still be standing on The Last Day? BB -- Appreciate your going to bat for me, but I will happily accept my persecution. SF's comment policy is a bit silly if you ask me. Everyone there, contributors and commenters, trash TEC, the sum of which is substantially encapsulated in what I had posted. I appreciate their fight for an orthodox redoubt in South Carolina, but to paraphrase Keynes, in the end all the orthodox in TEC are dead. The SC orthodox need to run to the exits while they can, before +Lawrence's head ends up on Schori's canonical pike or the South Carolina legislature changes the law to require courts to recognize trusts like the Dennis Canon. Truth -- If you had your own blog I would be happy to come over there and post it. Hagrid's slipped into the seat next to me here at the Cafe so I had better behave myself.